Private instruction for adults who are beginners, or returning to the piano after many years away. Group classes and workshops in which students get together and work on particular skills they want to improve, such as working on rhythm, technique, sightreading skills, and more. We also have Adult Piano Party Potluck Soirées, which are fun, informal get-togethers so that students can play for each other (or just listen, if they’re not ready!) pieces they’re working on. I’ve been playing for over 40 years, and I still can’t wait to get to the piano. I enjoy the process of figuring out a new piece, and working it until it’s right, which of course it’s never quite right! I have times when I’m frustrated that I can’t “get” a passage of music right away, but I know the techniques to get there, and I can help you get there, too. My goal as teacher for each and every one of my students – geared to their own abilities and interests – is to be able to play any piece of music they want to, no matter how difficult it is for them personally. It’s to guide all of you on your own journey of learning to play the piano. I work with adult students on both “classical” tracks (“classical” here includes many periods of Western music other than the Classical period), as well as tracks geared for those who want to play pop, rock, blues, jazz, blues, Broadway, movie themes, by sight-reading arrangements, but also from learning how to read lead sheets (also known as “charts”). So whether you’re interested in learning Beethoven and Bach, or you want to begin to learn how to play from charts or lead sheets, I say, let’s do it! To see what some of my adult students are saying, click here. Sharing our music together at one of our Soirées, an informal get-together we have every few months. I have singers come in who want to be able to accompany themselves, I have sightreaders come in who want to learn to read a “chart.” I have students who play at an advanced level, who want critique on performance, or who have trouble with sightreading skills. 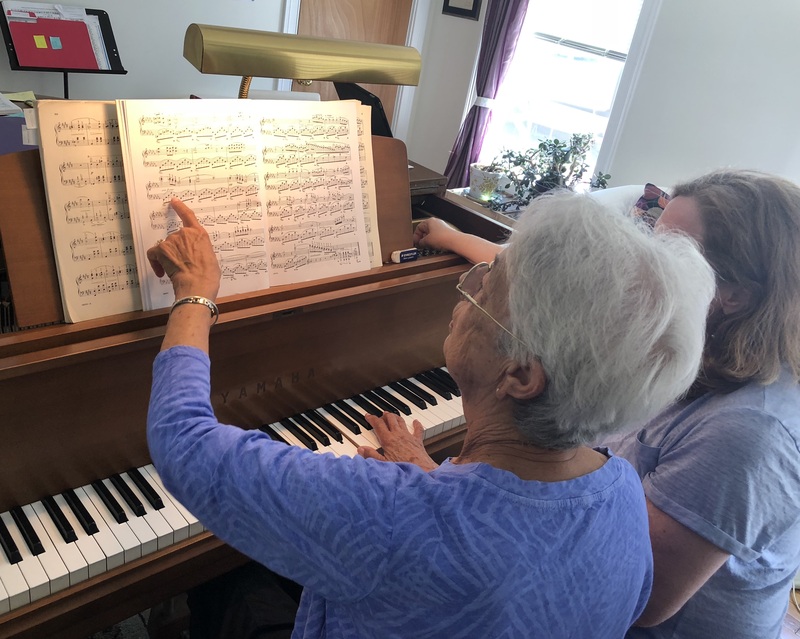 I have students who are brand new to piano and want to get started, from ages 20 to 80 and older!, working and retired, or who played as kids and are eager to get back to the piano! Yes, indeed! In the scheduling of my adult students, I can be more flexible. You can of course sign up for a weekly lesson, but I also offer lessons “a la carte.” No slots are available between roughly 2–6 pm for adults, which is my “prime-time” for my young students, but I have for all adult students both weekly and a la carte daytime and some evening slots available Tuesday–Friday. 45 and 60-minute lessons are offered as well as lessons “a la carte,” that is, not a regular weekly timeslot. Visit the Studio Policies page for more information on rates, lesson scheduling, calendar, and group events, etc. Want to get started, or want to know more? Contact me here.